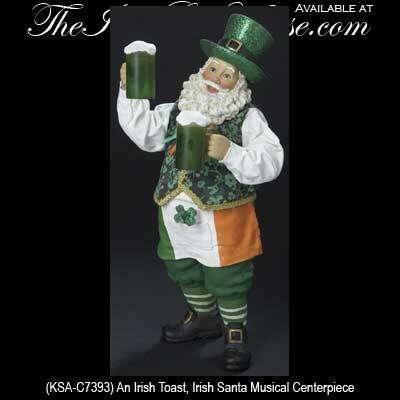 This musical Irish Santa decoration is named An Irish Toast and you may wind him up to play the melody to When Irish Eyes are Smiling. The Irish Santa features two frosty pints and a shamrock vest along with an Irish flag apron and a green glitter top hat. He stands 10" tall and is made of porcelain and Fabriché by KSA. An Irish Toast Santa is gift boxed with a shamrock history card, complements of The Irish Gift House.